Dr. Beena Upadhyay is a Consultant Obstetrician and Gynecologist in Sushant Lok. She is currently practicing at Vatsala Clinic in Sushant Lok. Dr. Beena Upadhyay has more than 17 years of experience. She is a qualified Obstetrician and Gynecologist in Sushant Lok. As an Obstetrician and Gynecologist, her area of expertise includes Pap Smear, Contraception Advice, Maternal Care/Checkup, High-Risk Pregnancy Care, Pre-conception Counseling, Multiload, Mirena Inersertion, Cancer Screening (Preventive), Infertility Evaluation/Treatment, Contraception (Multi Load Insertions), Cervical Cancer Screening & Vaccination, Abortion and Medical Termination of Pregnancy. Patients from Sector 57, Gurgaon and entire Gurgaon come to Dr. Beena Upadhyay with lots of hopes and the doctor ensures that the patients are satisfied with the treatments, with her experience and fully equipped clinic. Dr. Beena Upadhyay has completed her education mainly from Delhi. She did her MBBS from MAMC, Delhi in 1996, MD (Obstetrician & Gynecology) from MAMC, Delhi in 2000 and FMAS from World Laparoscopy Hospital, Delhi in 2003. Currently Dr. Beena Upadhyay is practicing as an Obstetrician and Gynecologist in Sushant Lok. She has also been the member of some prestigious organizations like Medical Council of India (MCI), Federation of Obstetric and Gynecological Societies of India (FOGSI) and Gurgaon Obstetrics & Gynecologic Society (GOGS). Dr. Beena Upadhyay is a well known Obstetrician and Gynecologist in Sushant Lok. Besides working as an Obstetrician and Gynecologist in Sushant Lok, Dr. Beena Upadhyay is a Visiting Consultant at Artemis Hospital and Visiting Consultant at Cloud Nine Hospital. 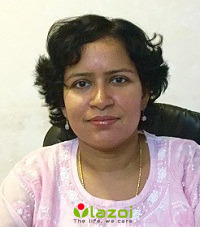 You can book an online appointment with Dr. Beena Upadhyay on www.Lazoi.com.